Native Americans have experienced a history full of oppression and racism since they were found on this continent by Europeans. The British and American governments have disregarded the land rights of Native Americans and used aggressive force to take their territories and destroy their people.This harrowing and compelling compilation of four award-winning documentary programs chronicles the struggles of Native Americans - from forced relocation on the Trail of Tears to the issues faced by America's aboriginal peoples today.TRAIL OF TEARS: CHEROKEE LEGACYThis two hour documentary explores one of the great historical tragedies of America's aboriginal people. In 1830, eager to gain access to lands inhabited by Native Americans, President Andrew Jackson enacted the Indian Removal Act. This forced the Cherokee Nation to leave their homeland. Many of these forced settlers suffered from exposure, disease and starvation. They arrived in "Indian Territory" with no past and no future.NATIVE AMERICAN HEALING IN THE 21ST CENTURY This comprehensive look at the ancient health and healing methods of American aboriginals uncovers the invaluable contributions that Native Americans made to early frontier living. Many of the healing plants and herbs that early European settlers learned from the aboriginal people have become important sources for modern methods of maintaining health.BLACK INDIANS: AN AMERICAN STORY This award-winning feature examines a minority group that is discounted and often ignored by mainstream media. Sharing a common past, some African Americans and Native Americans have combined to create a unique culture that combines their traditions. Little known, little documented, and often marginalized, this group has become all but invisible at the dawn of the new millennium.OUR SPIRITS DON'T SPEAK ENGLISH: INDIAN BOARDING SCHOOL This compelling documentary feature gives the Native American perspective on Indian Boarding Schools. It uncovers the dark history of U.S. Government policy, which took Indian children from their homes, forced them into boarding schools, and enacted a policy of educating them in the ways of Western Society. 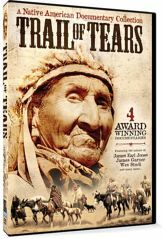 This award-winning film gives a voice to the countless Indian children forced through a system designed to strip them of their Native American culture, heritage, and traditions.